details of construction in each product tier. Original equipment style sails for boats up to 28’ max. These are factory equivalent (or better) replacement sails like originally come with most small production boats. Cruising grade polyester Dacron is used with triple step zig-zag stitching throughout. All corners have reinforcing patches and corner rings that are hydraulically pressed in place. Mainsails feature nylon headboards and luff hardware attached with shackles (or plain bolt rope if you prefer). Leech lines and tell tales are used in all sails. Standard / OEM sails are a great value which often last for many years under typical day sail use (with reasonable care and maintenance). Good for light duty cruise/race. Bag is included. Heavier construction for moderate use, especially in the corner patches and ring reinforcements. 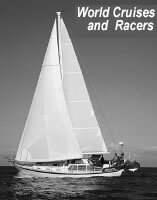 These sails are intended for coastal and medium duty cruising, club racing and generally good durability for boats up to 45’ max. Performance grade polyester Dacron is used and 2 or 3 rows of zig-zag are used throughout. Pressed corner rings are reinforced with webbing. One draft stripe and sailbag is included. Mainsails feature nylon glass reinforced headboards with bolt rope and luff hardware shackled on. 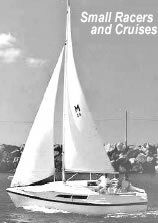 All sails have leechlines & telltales. Coastal sails offer good durability & performance. 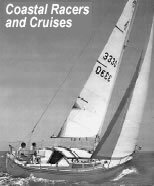 These are top of the line sails intended for blue water cruising, and performance sailing for any size boats. Premium grade polyester Dacron is used exclusively and seams are finished with three rows of alternate dark & light zig-zag stitching (dark stitching helps you to see when breakdown or damage occurs). Corner rings are reinforced with webbing and hand sewn leather on top. Mainsails have alloy headboards with l u ff and foot hardware webbed on. Offshore sails feature 2 draft stripes for visual reference of draft position, full rows of tell tales and sail bag. Offshore sails are extremely strong and low in stretch for durability and optimum performance over the widest possible wind range.